Unrefined series kukris are kukris made for raw power. They are especially designed for heavy hectic work and intentionally given a raw finish for daily rough use as polished blade when used would leave marks and scratches spoiling the looks of a kukri. Tempering also would be more comparing to finished (polished) blades as small fraction of tempering will lessen when shining kukri because of heat produced. Grip too would be better with unpolished wood and horn. 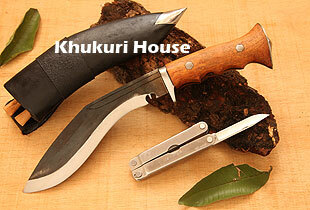 These raw kukris some how look like old kukris made centuires ago because there were no polishing machines. Unrefined series comprise of bhojpure, angkhola, panawal, sirupate, chainpure, junky jungle, historic kukris, kukri whacker to name a few.